I drove a 2007 Ford Edge for two years. Back then it was the second vehicle in our household. I had downsized from an Explorer. We would no longer be road-tripping with a family of four plus two Labrador retrievers. And, no longer be trailing a 20ft boat from storage to the launch ramp and back. This lifestyle change in our family is not unlike many others that happen all across the U.S. Hence, cars or vehicles that suit a variety of purposes and needs are what makes the market tick as families make the usual and normal lifestyle adjustments. The Edge has come a long way in the twelve years since 2007. It’s been significantly revamped, updated and improved over the course of these years. Gone is the mainstream V6 engine. Transmissions now have many more gears for better performance and lower fuel consumption. Advanced Driver Assistance Safety (ADAS) technology is helping to significantly reduce the risk of a crash. Materials have improved for an overall higher quality vehicle. 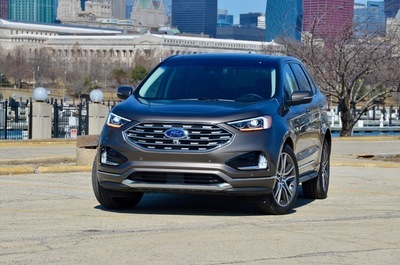 The Edge has a new look for 2019 with new front and rear styling. Up front the hood, grille and fascia are new. 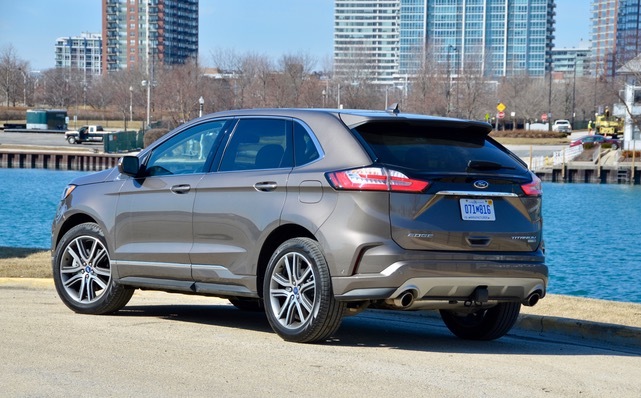 In the rear a new liftgate, taillights and fascia balance out the new look. Higher trim level models get bi-LED front lighting and new fog lamps. There’s a new selection of wheels to choose from. The cockpit has a nice, upscale feel. A new rotary shifter for the transmission makes more room for additional storage as well as a wireless charging pad. 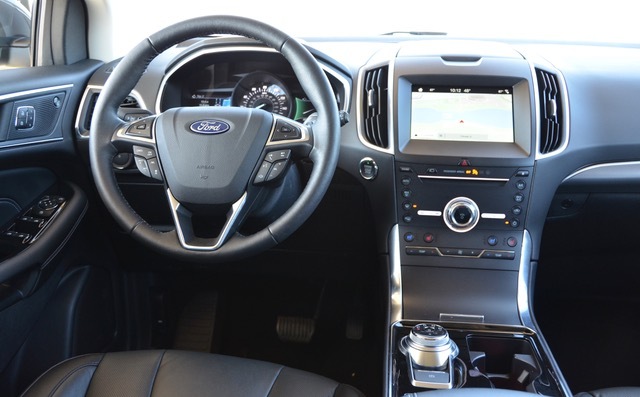 On the safety front Ford has upped the game making many ADAS features standard. 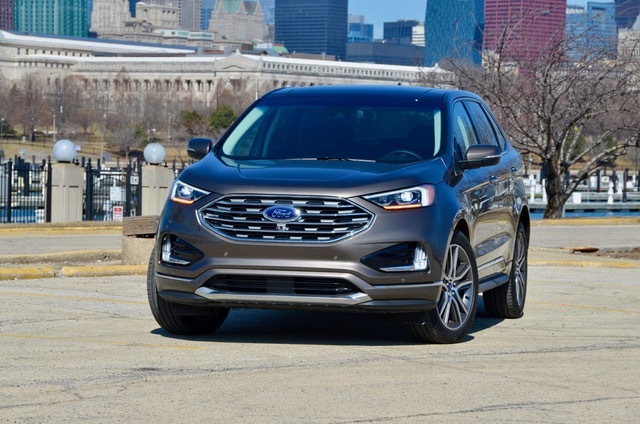 The Ford Co-Pilot360 suite of safety features includes Pre-Collision Assist with Automatic Emergency Braking, Blind Spot Information System with cross-traffic alert, Lane-Keeping System, rearview camera (which now has a washer) and auto high-beam headlamps. Post-impact braking and rain-sensing wipers are also standard. Adaptive Cruise Control with Stop & Go and Lane Centering, Evasive Steering Assist and voice-activated navigation with SiriusXM Traffic and Travel Link are available as an option. Edge is compatible with popular tech features such as available Android Auto, Apple CarPlay, Ford+Alexa and Waze navigation. There’s also a 4G wireless hot spot that can handle up to ten devices. The mid-size, front-wheel drive, 5- passenger Edge is offered in SE, SEL, Titanium and, new for 2019, ST trims. The new ST is powered by a 335-horsepower 2.7-liter EcoBoost V6. A 250-horsepower 2.0-liter twin-turbo EcoBoost 4-cylinder powers the other models. All use a new 8-speed automatic and all-wheel drive is optional, except on the ST where it’s standard. Base prices range from $29,995 to $42,355. My test-drive loaner from Ford was the Titanium model with a $40,545 base price. With options the bottom line totaled $47,815. 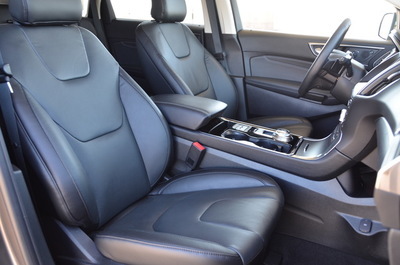 What I like most about the Edge is its relatively compact exterior and yet roomy and comfortable interior. 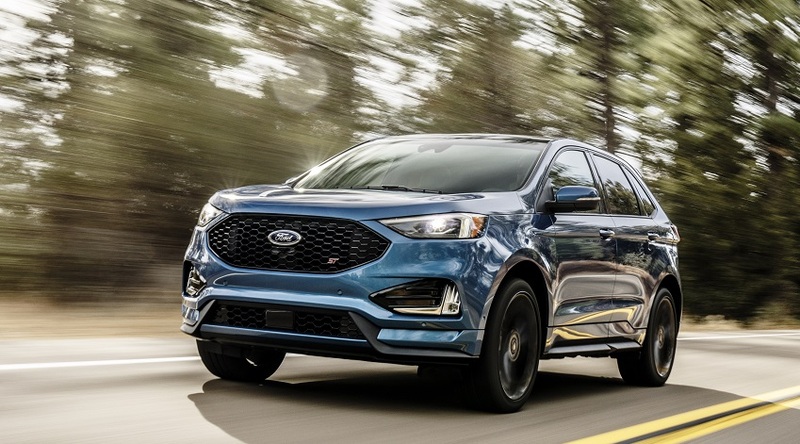 The Edge fits nicely between Ford’s smaller Escape and larger, three-row Explorer. If you don’t need three rows of seats or a lot of towing ability, as was my case back in 2007, the Edge works great. It’s very urban consumer friendly. Large door openings and a not-too-tall ride height make for easy entry and exit. Outward sight lights are unobstructed and Ford has done a good job of minimizing blind spots at the A-pillars and front mirrors. Cargo room behind the second row is 39.2 cu.ft. that opens up to 73.4 cu.ft. with the seat folded down. Overall, performance from the 2.0-L turbo engine and the 8-speed automatic is very satisfying, especially in the critical 45-65 mph overtaking range. EPA test-cycle ratings are 23 mpg combined with 21 city mpg and 28 highway mpg. Most of my driving was on stop-and-go city streets where fuel consumption is the highest. I did make a few highway runs to get a sense for overall NVH. Wind noise is minimal as is tire noise. Ride and handling is quite confident with nicely compliant suspension tuning. 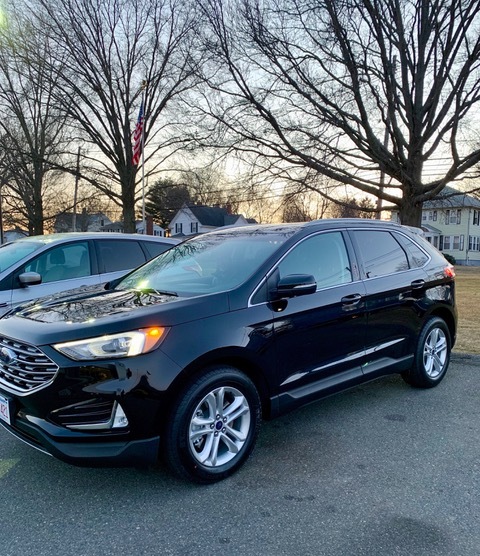 Coincident to my drive in the 2019 Edge, my younger millennial daughter and her husband just took delivery of a new 2019 Edge SEL. They had been driving a 2016 Ford Escape that was coming off lease and were looking for a bit more interior room. Wanting to stay in the Ford family, they took a look at the Explorer but decided it was way more vehicle than they needed. In a phone conversation I asked “How do they like their new Edge?” My daughter’s reply was “What an upgrade.” They had been looking forward to the heated steering wheel and power hands free liftgate. Remote start and wireless charging have also become favorites. And their 90lb. Bernese Mountain dog is liking the larger rear space. I haven’t had the opportunity to drive the new ST model with its 335-horsepower. It’s the first Ford SUV tuned by the Ford Performance Team and features an available performance brake package and ST-tuned sport suspension along with unique styling elements and 21-inch wheels. I’ll report more after a test drive, which might just happen this spring. 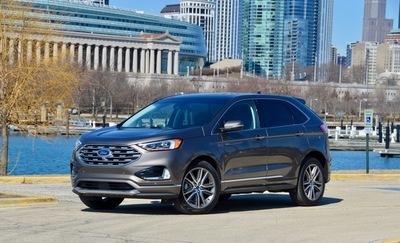 More information, details and specs on the 2019 Ford Edge can be found at www.ford.com. The good news for new vehicle buyers today is that there are many very good choices on the market. There’s something for everyone’s taste, needs and pocketbook. Going forward we’ll continue to see more choices.